AI Festival 2015: Terminator at the Doorstep – Just how Dangerous is AI? 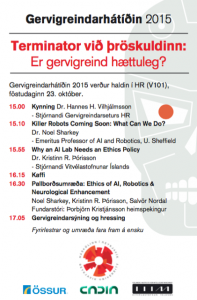 Together with Reykjavik University’s CADIA, IIIM has revealed the schedule for this years AI Festival. Join us for an afternoon of lectures and discussion on Friday October 23 from 3-5.30 pm. All the lectures will be in English and the festival is open to everyone. 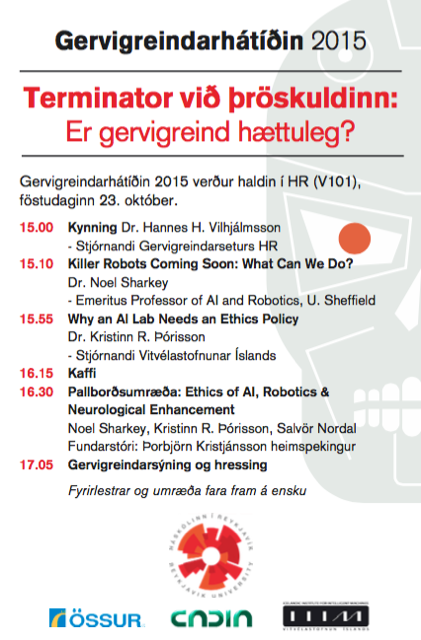 16.30 Panel: Noel Sharkey, Kristinn R. Þórisson & Salvör Nordal on the Ethics of AI, Robotics & Neurological Enhancement. Moderator: Þorbjörn Kristjánsson philosopher. 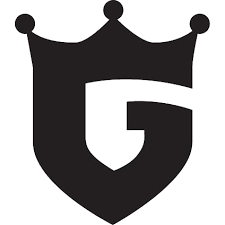 Recently, Dr. Kris R. Thorisson sat down with the Grapevine and talked about technological and ethical challenges of AI, and much more. Read the interview here.